A second major shelter has opened in Houston following Harvey’s landfall and it’s welcoming the first of up to 10,000 evacuees. At least 10 buses pulled up to the NRG Center on the south side of the city just before midnight Tuesday. Those in wheelchairs entered first, followed by the first of what officials said could be up to 2,000 people by sunrise Wednesday at the conference hall adjacent to the decommissioned Astrodome and the city’s NFL stadium. The George R. Brown Convention Center downtown has filled to nearly double its originally announced capacity of 5,000 in the five days since the storm first made landfall as a Category 4 hurricane. The evacuees brought to NRG Center came from other parts of the metro area. Photos with pleas for help in finding the missing from Tropical Storm Harvey are being posted and retweeted by the thousands as desperate family members seek loved ones who they fear might be dead, but may only have a dead phone. No official number of missing has been released Tuesday night, but dozens of missing-person photos are circulating on social media. Some are getting results, though not always positive ones. The family of Ruben Jordan, a 58-year-old retired football and track coach from a Houston-area high school, spread pleas on Twitter and Facebook for 48 hours before they were told he was found dead Tuesday. The mother of baby Paige Booth was frantic for four hours after she handed off her baby to a police officer amid chest-high water then couldn’t find her. After a series of posts, she got a call from a family of strangers that had her baby, and the two were soon reunited. The Rockport-Fulton Fighting Pirates won’t take the field Friday for their season opener, but some of their players took to the field Tuesday to help clean it up. Winds from Harvey last week sheared the uprights from both goal posts, stripped most of the metal from the stadium scoreboards, scattered sheet metal through the stands and destroyed the gymnasium where the girls’ volleyball team plays. By word of mouth, some football and volleyball players met Monday afternoon to begin the cleanup. Even more players showed up Tuesday. Athletic director Jay Seibert said that after three weeks of practice and a scrimmage, his players are now scattered all over the state after evacuating the coastal town near Corpus Christi and that the Pirates will not be able to play this week. Right guard Angelo Trevino said that returning to the field will help the community recovery effort. Harvey made landfall near Rockport last Friday as a Category 4 hurricane. Officials say they have received disturbing reports of people impersonating Homeland Security special agents and telling residents to evacuate in order to rob their homes. The city of Houston says people should ask anyone knocking on their doors for official badges and credentials with their name and organization. The city’s statement also notes that during Harvey relief efforts, U.S. Immigration and Customs Enforcement is not conducting immigration enforcement operations in the area. The city also says in a tweet in both English and Spanish that it is not checking the immigration status of anyone coming into shelters. The death toll from Harvey has risen to at least 18 as three more fatalities have been confirmed in the Houston area. The Harris County Institute of Forensic Sciences updated its storm-related deaths Tuesday night to include an 89-year-old woman, Agnes Stanley, who was found floating in 4 feet (1.2 meters) of floodwater in a home. A 76-year-old woman was found floating in floodwater near a vehicle. Her name was not released. A 45-year-old man, Travis Lynn Callihan, left his vehicle and fell into floodwaters. He was taken to a hospital, where he died Monday. Family members and authorities have reported at least 18 deaths although the bodies of some victims apparently swept away in the floodwaters have not been found. Singapore’s defense ministry says as many as four of its military helicopters will start assisting in Tropical Storm Harvey relief efforts Wednesday. The CH-47 Chinook helicopters are stationed in Grand Prairie, Texas, as part of a decades-long partnership between the Republic of Singapore Air Force and Texas National Guard. Singaporean airmen who train there learn how to face large-scale emergencies. The ministry says the helicopters will be able to airlift troops, evacuees and supplies in the relief effort. Prime Minister Lee Hsien Loong made the offer in a call with President Donald Trump late Tuesday. Both leaders are set to meet at the White House in October. Singapore made a similar offer after Hurricane Katrina in 2005. Houston officials are opening a major shelter at NRG Park that can accommodate up to 10,000 evacuees from Harvey. Darian Ward, a spokeswoman for Houston Mayor Sylvester Turner, said the convention center adjacent to the city’s NFL stadium and the Astrodome will open at 10 p.m. Tuesday. The new shelter will provide the city with additional capacity because the number of evacuees at the George R. Brown Convention Center is approaching 10,000, double its original capacity. Just 500 cots are being added to the floor of the Toyota Center, as the nearby downtown convention center will remain the primary major shelter for evacuees of Tropical Storm Harvey. Tom McCasland, Houston’s housing and community development director, told The Associated Press Tuesday that the Toyota Center— where the NBA’s Houston Rockets play — will serve as an overflow center for people still arriving Tuesday night and early Wednesday. It will only serve families with children that don’t have pressing medical needs. The George R. Brown Convention Center has an estimated 9,000 people seeking shelter. McCasland says more cots are on the way for thousands of people who didn’t have one Monday night. Some people slept on towels or strips of cardboard. Federal and local agencies say they have rescued more than 13,000 people in the Houston area as well as in surrounding cities and counties in Southeast Texas since Tropical Storm Harvey inundated the area with torrential rain. Houston Police Chief Art Acevedo said Tuesday his agency has rescued about 4,100 people. Houston Fire Chief Samuel Peña says his agency has rescued more than 3,000. Parisa Safarzadeh, a spokeswoman for the Harris County Sheriff’s Office says her agency has rescued more than 3,000 people. Houston is located in Harris County. U.S. Coast Guard Lt. Mike Hart says his agency has rescued more than 3,000 individuals. Hart says the Coast Guard total includes rescues in Houston, but also in outlying cities and subdivisions outside of Houston, as well as in surrounding counties, including Brazoria, Galveston and Matagorda. Beaumont police say a woman has died after she and her young daughter were swept into a rain-swollen drainage canal while trying to escape their stalled vehicle. A police statement said the woman pulled her vehicle into an office park’s flooded parking lot about 3:35 p.m. Tuesday, where it became stalled by high water. The woman then took her daughter, exited the car and was swept about a half-mile away. Two Beaumont police officers and two fire-rescue divers in a rubber boat spotted the mother floating with the child, who was holding onto her mother. Officers pulled the child and the mother into the boat. The child was responsive but suffering from hypothermia; the mother was unresponsive and efforts to revive her failed. The child is hospitalized in stable condition. Authorities and family members have so far reported more than a dozen deaths from Harvey. This item corrects the location of the parking lot. Houston Mayor Sylvester Turner has amended his curfew order to run from midnight to 5 a.m., instead of beginning at 10 p.m.
Turner announced the change on Twitter Tuesday evening, about an hour after initially imposing the curfew. Police Chief Art Acevedo said at an earlier news conference that curfew violators will be stopped, questioned, searched and arrested. There have been scattered reports of looting during the flooding from Tropical Storm Harvey. Houston Mayor Sylvester Turner says that the Toyota Center — home of the NBA’s Rockets — has been opened as a shelter for people displaced by flooding from Tropical Storm Harvey. Turner announced during a news conference Tuesday evening that the downtown basketball arena will be used to help reduce overflow at the nearby George R. Brown Convention Center, which is now sheltering 10,000 people. Officials had initially planned to have 5,000 individuals at the convention center. Turner says people will still have to go to the convention center first before going into the Toyota Center. Turner thanked Rockets owner Les Alexander for letting the city use the basketball arena as a shelter and also thanked him for his donation of $10 million for Harvey relief efforts. 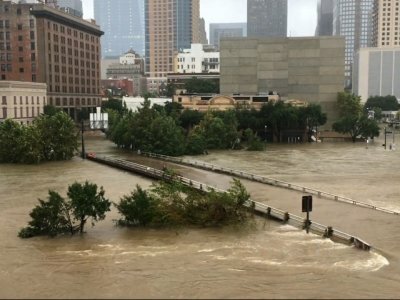 Turner says because Houston police have been spread thin due to ongoing water rescues and other efforts, 50 Texas National Guard members will be stationed at the convention center to provide security. Officials say they have evacuated homes northeast of Houston after a chemical company said there is a risk of an explosion at its flooded plant. The Harris County Fire Marshal’s office said in a tweet Tuesday that homes within 1.5 miles (2.4 kilometers) of the Arkema plant in Crosby have been evacuated out of precaution. Arkema says in a news release that it manufactures organic peroxides in Crosby, about 25 miles (40 kilometers) northeast of Houston. The company says the chemical compounds must be stored at low temperatures, but it lost refrigerated storage after power went out and backup generators were inundated. Harris County has confirmed the storm-related death of 64-year-old Alexander Kwoksum Sung, who drowned at a clock repair business Sunday in Houston. He was found in more than a foot of debris on Monday. Authorities and family members have so far reported more than 10 deaths from Harvey. Houston Mayor Sylvester Turner says he is imposing a 10 p.m. to 5 a.m. curfew in order to ensure public safety. Turner says at a news conference Tuesday that there is no reason for people to be on the streets during those hours. Police Chief Art Acevedo said violators will be stopped, questioned, searched and arrested. Authorities at a small city near Houston say a boater who was helping rescue people from the Harvey floodwaters has located a deceased man. Friendswood Police spokeswoman Lisa Price said Tuesday authorities are not exactly sure how the man died and they haven’t been able to confirm his identity. Price says officers are still on the scene and the body has been taken to a funeral home. Authorities earlier had confirmed five deaths that are believed to be related to Harvey. Another six people are missing and presumed dead after a van fell into a bayou. One of the nation’s busiest trauma centers has abandoned evacuation plans and will discharge patients more quickly as it prepares for an expected surge of new patients with injuries related to Harvey. Spokesman Bryan McLeod said Tuesday that Ben Taub Hospital’s case management workers will help patients who “no longer require hospitalization” get back home or to shelters if their homes are flooded or inaccessible. Ben Taub is Houston’s main public hospital of last resort, and many patients are poor and uninsured. Building repairs continue on a burst sewage pipe and leaks that damaged the basement of the hospital’s main building and affected pharmacy, food service and other key operations. McLeod said the hospital has enough food to last until Thursday, when all hospital staff and administrators will be expected back at work. Authorities say an 81-year-old woman has died after her vehicle was caught in floodwaters caused by Tropical Storm Harvey in Walker County, north of Houston. Officials with the Texas Department of Public safety say a state trooper out checking the road conditions early Tuesday morning came across Ola Winfrey Crooks’ vehicle. Sgt. Richard Standifer with the Texas Department of Public Safety tells The Associated Press that the trooper contacted the swift water rescue team, which recovered the body. Sgt. Steven McNeil with the Texas Department of Public Safety tells the Huntsville Item newspaper that a preliminary investigation indicates Crooks drowned when her car was swept off a farm-to-market road at the San Jacinto River near her home. McNeil says it appears Crooks was trying to cross the bridge and the swift water carried her vehicle off the road and into the flood waters. This item corrects the woman’s age from 83 to 81 and her middle name from Mae to Winfrey, according to Sgt. Richard Standifer. Hundreds of people are waiting in line at the George R. Brown Convention Center to register with the Federal Emergency Management Agency for disaster assistance. Many evacuees arrived with what was in their pockets and nothing else. John Boyce lived in a west Houston apartment and had to be pulled out by boat. He was initially taken to a local hospital and was given paper scrubs to wear before being taken to the convention center, because his clothes were wet and soaked in sewage. His two possessions are a cell phone and a wallet. He dried the cards inside the wallet on a piece of cardboard, and his cellphone worked after he held the battery under a bathroom hair dryer. He took his first shower Tuesday in a mobile unit brought in by the Red Cross. FEMA is expected to provide assistance to people left homeless in Harvey. For the drenched Houston region, an end to the rain and a sunny day are almost in sight. But that’s only because meteorologists forecast Harvey to come inland Wednesday, then slog through Louisiana and take its downpours north. Arkansas, Tennessee, parts of Missouri and southern Illinois are on alert for Harvey flooding in a couple days. Harvey is forecast to return inland around the Texas-Louisiana line and close to Beaumont, Texas, early Wednesday morning or late Tuesday night with 45 mph (72 kph) winds and heavy rains, spending much of Wednesday in Louisiana. Along the Gulf Coast, rain is expected to continue Wednesday but taper off. But Feltgen cautioned that this doesn’t mean Harvey is ending. Flash flood watches are already posted for parts of Tennessee, southern Illinois and southeast Missouri. Those areas and Arkansas could get six or seven inches of rain, but it won’t be anything like what southeast Texas got. In far North Dallas, hundreds of volunteers are handling a steady stream of cars, trucks and trailers loaded with water, diapers and other goods for hurricane relief. The drop-off point announced by the city of Dallas is managed by the nonprofit Trusted World, which also has other drop off points in office buildings and other public locations. The volunteers say they have seen thousands of vehicles loaded Tuesday with items to donate for hurricane relief. The volume of vehicles loaded with items to donate extended out onto and down the northbound frontage road of the Dallas North Tollway. One 34-foot trailer belonging to a cabinet maker was filled with bottled water and other items. The drop-off point was open from 3 p.m. to 8 p.m.
Harvey has gained a bit of strength but stayed a tropical storm. Its winds increased from 45 mph (72 kph) to 50 mph (80 kph). But the National Hurricane Center says that reading Tuesday afternoon may be unusual because it was from a low flying hurricane hunter airplane. Forecasters say heavy rains are continuing to spread over southeastern Texas and southern Louisiana. The rains in Cedar Bayou, near Mont Belvieu, Texas, reached 51.88 inches (132 centimeters) as of 3:30 p.m. CDT. That’s a record for both Texas and the continental United States but it doesn’t quite pass the 52 inches (133 centimeters) from tropical cyclone Hiki in Kauai, Hawaii, in 1950 (before Hawaii became a state). An official says that a levee protecting a subdivision of homes in a county south of Houston has been fortified after being breached but warns the threat is far from over. She says that some water did get through but it wasn’t substantial. She warns that authorities don’t know how long the fortification will hold. She also notes the breach happened due to rainwater but that the nearby Brazos River continues to spill out of its banks. Trower says that the mandatory evacuation ordered Sunday morning still stands and notes that most of the residents in the area have left. Brazoria County Judge Matt Sebesta has said that there are hundreds of homes in the tree-lined subdivision situated around a golf course. Federal regulators say dozens of offshore oil-and-gas platforms and rigs in the Gulf of Mexico have been evacuated as Tropical Storm Harvey continues to dump heavy rainfall on the region. The U.S. Bureau of Safety and Environmental Enforcement said in a statement Tuesday that workers were evacuated from 102 production platforms, which is nearly 14 percent of the 737 manned platforms in the Gulf. Five of the 10 drilling rigs currently operating in the Gulf also had been evacuated as of noon Tuesday. The bureau estimated that approximately 19 percent of the Gulf’s oil and natural gas production was “shut-in,” or temporarily halted, as of midday Tuesday. Offshore facilities will be inspected once the storm has passed. The Texas Gulf is a key area for U.S. oil refineries and oil and gas production. Facebook and Google are matching donations to people affected by Hurricane Harvey, the tech giants announced on Tuesday. Facebook says it will match every dollar raised through its platform, up to $1 million, for the Center for Disaster Philanthropy’s Hurricane Harvey Recovery Fund. The money will support local recovery and rebuilding efforts. U.S. Facebook users are getting a message at the top of their news feed on how to donate. Google says it is matching $1 million in donations to the American Red Cross. To donate, go to https://www.google.org/harvey-relief/ . The company also matched donations from employees, and said Tuesday it donated $750,000 between its nonprofit arm, Google.org, and employee contributions to organizations such as the American Red Cross, Habitat for Humanity and Save the Children. Houston Mayor Sylvester Turner confirmed that police Sgt. Steve Perez has died after he became trapped in his patrol car as he was driving to work. The Houston Chronicle has reported that the 30-year officer was heading to work Sunday when he became trapped in high water on Interstate 45 in north Harris County and then couldn’t get himself out of his car. NAACP interim President Derrick Johnson says his organization will carefully monitor government assistance in Houston and other areas to ensure minority neighborhoods get adequate resources following Harvey’s destruction on the Gulf Coast. Johnson told the National Press Club Tuesday that he met with officials from the Federal Emergency Management Agency earlier in the day. He says the NAACP has a responsibility to make sure “equity is at the table” during recovery efforts, noting that minority neighborhoods suffered disproportionately during Hurricane Katrina. Gov. John Bel Edwards says Louisiana is offering to shelter storm victims from Texas while the state also helps its own residents who were rescued from Harvey’s floodwaters overnight. Edwards said at a news conference Tuesday in Baton Rouge that he expects Texas officials to decide within 48 hours whether to accept the offer and transport flood victims to Louisiana shelters. Approximately 500 people were evacuated Monday night and early Tuesday from flooded neighborhoods in southwest Louisiana. Edwards says about 200 of them spent the night in area shelters. Edwards says more than 600 members of the Louisiana National Guard are on storm-related duty. Many are assisting with rescue efforts. Edwards says Tropical Storm Harvey was strengthening slightly after moving back into the Gulf of Mexico but wasn’t expected to become a hurricane again before its predicted Wednesday landfall in Louisiana. Volunteers and donors are lining up outside of the Toyota Center, the downtown arena that’s home to the Houston Rockets, in anticipation that it will open as a shelter for Harvey evacuees. City officials and Red Cross spokesmen have not confirmed that the arena will open to shelter evacuees. But several people who went to the George R. Brown Convention Center to volunteer or drop off clothes were told that the Toyota Center would open Tuesday afternoon. Around 30 people are waiting outside an arena entrance. The convention center has nearly doubled its original 5,000-person capacity, and Mayor Sylvester Turner says the city may open multiple major shelters to accommodate the thousands of people still seeking shelter. Houston Fire Chief Samuel Peña says his agency has responded to more than 1,000 calls for service — including 400 water rescues — since Harvey inundated much of the city. Peña says some fire department crews have been working for three days straight, without a break, and he has implemented procedures to ensure firefighters get the nourishment and rest they need. Peña says the fire department is managing the resources it has on hand and will rotate in fresh firefighter crews as it is able to do so. The University of Tampa has fired a visiting assistant professor who suggested in a tweet that Harvey’s destruction is “instant karma” for Texas because it voted Republican. Officials said another sociology professor will take over Storey’s classes. Weather forecasters expect Tropical Storm Harvey to come ashore somewhere near Louisiana’s southwestern corner, following its trip through Texas and return to the Gulf. National Weather Service meteorologist Roger Erickson said Tuesday that officials project a landfall in Cameron Parish around midday Wednesday. Erickson says another 4 to 8 inches (10 to 20 centimeters) of rain is likely across southwest Louisiana. Forecasters also project heavy rain running east from New Orleans to Pensacola along the Gulf Coast. Harvey is expected to bring gusts up to 45 mph (70 kph) in coastal areas and gusts of up to 35 mph (55 kph) in Lake Charles and along the Interstate 10 corridor. Erickson warns that some coastal rivers won’t be able to drain rains effectively because Harvey’s winds are pushing storm surge into coastal waters, aggravating flooding in places that have already received more than 20 inches of rain. The Salvation Army says it has provided more than 5,000 meals in the Houston area since Harvey swamped parts of the city. A Salvation Army statement Tuesday said the charitable group has deployed 42 mobile units that each can provide up to 1,500 meals per day. The group also sent two field kitchens, which can each serve up to 15,000 meals per day, to emergency personnel and flood survivors. The Salvation Army says multiple staging areas are being set up across Texas to coordinate relief efforts as Harvey impacts more people. Those sites include Houston, San Antonio, Victoria and Arlington. Lt. Col. Ron Busroe says donations from the public will help provide food, shelter and other valuable resources to people in Houston. There was no escaping Harvey for members of one Southeast Texas family who found themselves on an extended stay at a New Orleans bed-and-breakfast — where sandbags are in place to guard against possible Harvey-related floods. The Auld Sweet Olive Bed and Breakfast is the new, temporary home for Joe Aldape (ahl-DAH’-pey), his sister Cynthia, his son Joseph and other family members from the League City, Texas, area. They had forged ahead with New Orleans vacation plans as Harvey developed. As of Tuesday, they had no way to return to their flooded homes. Meanwhile, bands of rain from Harvey prompted flash flood watches in New Orleans. Bed-and-breakfast owner Nancy Gunn said her business took on water during Aug. 5 flash floods, but that it has not flooded so far during Harvey’s rains. A South Texas ferry system operated by the state is closed to the public until further notice after at least two vessels were damaged during Hurricane Harvey. A Texas Department of Transportation spokesman said Tuesday that all seven boats in the Port Aransas (uh-RAN’-suhs) Ferry System are being assessed. Rickey Dailey says the ferries must pass Coast Guard inspection before returning to service. The ferry system provides free transportation connecting travelers between Aransas Pass on the mainland and Port Aransas on Mustang Island. It’s a quarter-mile trip. The ferries, each capable of transporting at least 20 vehicles, were taken out of service Friday morning as Harvey approached Port Aransas, about 30 miles (48 kilometers) northeast of Corpus Christi. The area is where Harvey made landfall Friday night. Dailey says all seven ferries were docked on the Port Aransas side when the storm hit. Kim Kardashian West and her famous siblings are donating $500,000 to help victims of Hurricane Harvey. A spokeswoman for the reality star says she and her mother and sisters have given $250,000 to the Red Cross and $250,000 to the Salvation Army on Tuesday. Kardashian West announced the donation on Twitter Tuesday, saying: “Houston we are praying for you.” She used the hashtag #HoustonStrong. They are among several stars who’ve said publicly they are helping hurricane victims. Kevin Hart on Monday announced a $25,000 donation to the Red Cross for storm victims and called on other celebrities to do the same. Houston plans to open up at least two more big shelters to house people trying to escape Harvey’s floodwaters. Mayor Sylvester Turner said at a news conference Tuesday that more than 9,000 people are now staying at George R. Brown Convention Center — the largest shelter that has so far been opened. The capacity at the convention center was supposed to be 5,000 people. Turner says Houston will open up two new big shelters, and possibly a third. He didn’t identify where the shelters would be. More details are expected later Tuesday. Turner says the number of people at the convention center has continued to grow because the facility is housing not only Houston residents but people from surrounding communities outside the city limits who are in need of shelter. The mayor of Galveston is asking residents to stay put and off flooded roads as the city anticipates more rain from Harvey. Mayor Jim Yarbrough says the city of about 50,000 could get up to 4 more inches (10 centimeters) of rain by Wednesday. The mayor says he wants Galveston residents to stay off the roads until conditions improve. Public transportation is not in service in Galveston. The city is 50 miles (80 kilometers) southeast of Houston. The Port of Galveston remains closed. Houston’s top law officer is warning would-be looters amid flooding from Harvey. Police Chief Art Acevedo said during a news conference Tuesday that armed robbers were apprehended overnight and a “handful” of looters were also taken into custody. He didn’t say just how many have been arrested on charges related to looting. Acevedo says he’s spoken with the Harris County district attorney’s office to ensure anyone suspected of looting is prosecuted. He also says he’ll lobby judges and prosecutors to secure the most severe punishment Texas law allows.